We hire a wide range of instruments suitable for beginners to intermediate players. a) Many students end up wanting an instrument other than the one they start out on. b) As children grow older, they may need to go up a size, for example in violin, cello and guitar. c) The instrument may only be required for a limited time, for example a one year band engagement. We understand that there is nothing more frustrating than learning on and inferior musical instrument. Consequently we only hire out top quality, name brand units. Please note that the photos on this page are for illustration purposes only and actual products may differ in appearance and specifications. If you prefer to buy a quality Flute, please go to our: Sales page. If you prefer to buy a quality Clarinet please go to our: Sales page. If you prefer to buy a quality Saxophone, please go to our: Sales page. If you would like to buy a quality Trumpet, please go to our: Sales page. CONCERT QUALITY VIOLINS WITH OBLIGATO STRINGS: $110 per day. CONCERT QUALITY CELLOS: $250 per day. From $75 per month. Available in Sydney area only. Delivery and pickup from $85 each way depending on location. Various sizes available in popular brands. We also hire electric pianos from $70 per month. All instruments supplied undergo an extensive pre-delivery inspection and set-up process. This ensures the instrument will arrive at your door able to be played at its optimum performance level. All instruments listed above are in stock and available for immediate dispatch. Prices quoted are in Australian dollars and include 10% goods & services tax (GST). Minimum rental period - 4 months. If you would like more information about our hire service, please phone us on 02 9389 8440, or send an email to: info@allmusic.com.au and we will send you a rental agreement form. We ship to NSW, Victoria, Queensland, South Australia, ACT, Western Australia, Tasmania and Northern Territory. If you would like to take lessons using any of the above instruments, we have an extensive database of experienced teachers to choose from. Simply go to the appropriate link on the left hand menu and contact us to make a booking. Electric Guitars - Fender (Mex), Ibanez, Yamaha or similar - subject to availability. Bass Guitars - Ibanez SR300DX Active bass, Yamaha or similar - subject to availability. Includes case and stand. Stage Piano - Casio PX200 or similar with hammer action keys and double braced stand. Guitar Amplifiers - Fender HotRod Deluxe Valve amp with reverb. Effects pedals also available for hire. Bass Amplifiers - Fender Rumble. 15"
speaker 150W power. Plenty of power to be heard over the drums. velocity sensitive synthesizer. Keyboard amplifiers also available for hire. Electric Acoustic Guitars - Fender Solid top with Fishman pickups. This is a performance level instrument. Jazz Guitars - Ibanez arch-top jazz guitar with twin humbuckers including hard-shell case and stand. Keyboard Amp - Behringer 90W with digital reverb. Has mic input and can be used as acoustic guitar amp. 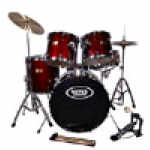 Electronic Drum Kit - Roland kit with realistic feel pads and many drum and percussion sounds to choose from. Alto and Tenor Saxophone - Eb Altos and Bb Tenors. Bring your mouthpiece for hygiene reasons, or buy one from us. Music Stand - High grade aluminium, fully adjustable unit for orchestral, choral or studio applications. Concert Violin - Solid body with Pirastro Obligato strings. Complete outfit with case, bow and rosin. Cello - Cervini solid carved top with Helicore or similar strings. Includes hard case and bow. Double Bass - Laminated top and body 3/4 size. Solid body also available for an additional $70 per day. Terms and conditions: Prices include GST. A $200 bond is required. It is refundable upon return of rented items in undamaged condition. If equipment is stolen, lost or destroyed during the term of the hire, hirer will be liable for full replacement value of the item(s). We can deliver in Sydney Metro area or you can pick the equipment up yourself.